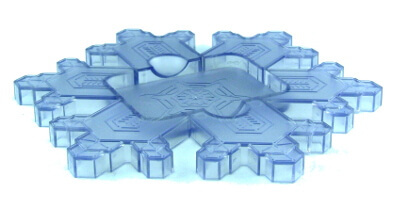 The Crystal HARMONY & EQUILIBRIUM is a unique system in the world to inform the liquids you use and the environment in which you live thanks to the Kolzov plates. This is a study about the Crystal. "Study of the effect of the product "Crystal of harmony and balance" on the physical space and the various correcting devices, for example, the KFS "Gold sand". Name of laboratory The laboratory of the Biophysics of water and Methodology of aquatic health technologies. 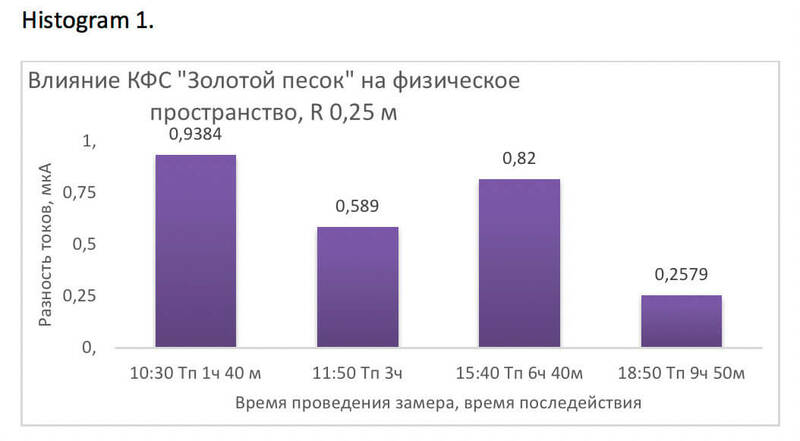 Research program: Evaluation of changes of state of physical space was carried out differential-conductometric method approved by the section on traditional medicine by the scientific Council MOH of the Russian Federation in 2001, Patent RF № 2109301. The method is based on the property of high cleaning water to change phase state (polycrystalline structure) under the influence of external fields. When this occurs, the structural transformation of the water associates, leading to changes in water conductivity, as measured by the instrument – the universal energy-information analyzer (UEA), developed by d.b.N. S. V. Zenin. UEA allows you to record extremely weak physical fields on the basis of changes in water conductivity depending on the kind of impact. 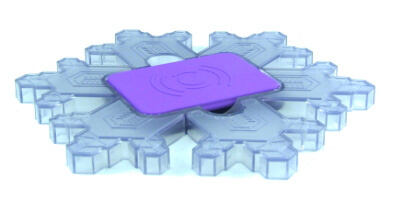 The ability of a material object (matter) to energy-exchange – anypotential can be measured as the difference between the currents in the experimental and control cuvettes specified method. As the source water sample was used deionized water with a specific resistance of 18 Mω ("Super-Q" firms "Millipore"). Source water samples exhibited for 2 hours in a glass laboratory buksh 100 ml on the surface of the investigated product: "a Crystal of harmony and balance" (patented in Russia), KFS Kolzov S. V. "Golden sand". CFS "Golden sand" embedded in "Crystal of harmony and balance," and at a distance of 0.25 m from each of them. After exposure, the products were removed from the premises of the laboratory, and samples of water, 20 ml, was subjected to differential conductometric studies. The determined initial capacities and the relaxation rate of the residual – state of water environment after the removal of external influences, over time aftereffect from 2 to 10 hours. The currents of conductivity are shown in Graph 1. 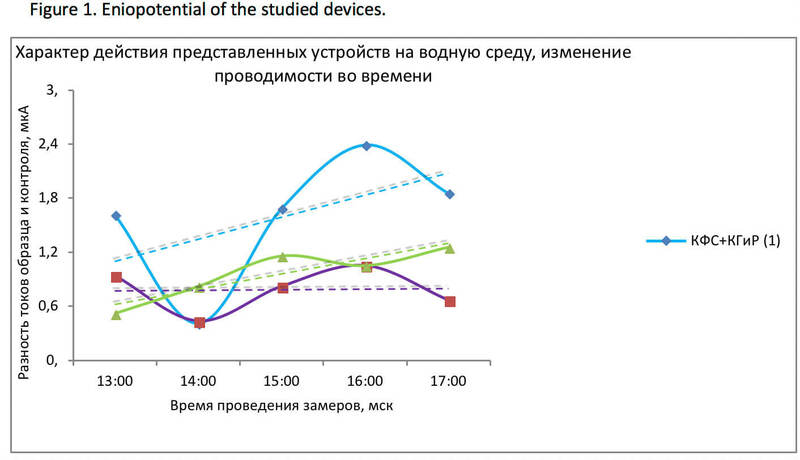 To assess the change of physical space in the immediate vicinity of the devices, the same measurements were conducted for water samples exposed at a distance of 0.25 m from them eventually aftereffect to 12 hours (figure 2, Histogram 1, 2). The relative change in conductivity, depending on time and distance, are presented in Table 1. The results of the research and analysis of the data: Kinetics of change of conductivity was filmed for 15 min to achieve the effect of saturation, was determined average values. In these histograms, graphs, and tables show average values for the respective points in time. The table shows the relative variation of conduction currents of water samples exposed on the device and in close proximity to them. Changes in the electrical conductivity of water for all three samples confirm the process of physical activation on the investigated devices. 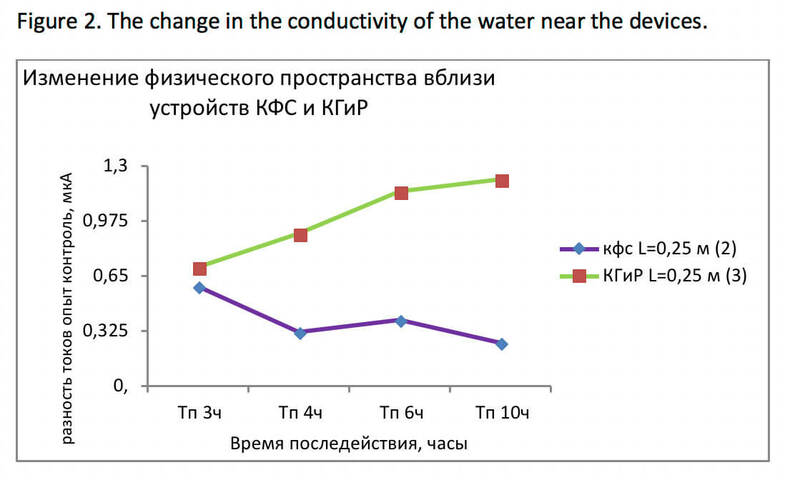 The difference of currents of the sample/ control for KFS – line 2, was 0,82 µA for a Crystal of harmony and balance (CH&B) – line 3, amounted to 1.12 µa for a combined effect of KFS and CH&B– line 1, was 1.55 µa. The dynamic in time of the structural reorganization of the water environment, its sinusoidal form for lines 1 and 2 characteristic manifestations of living systems. 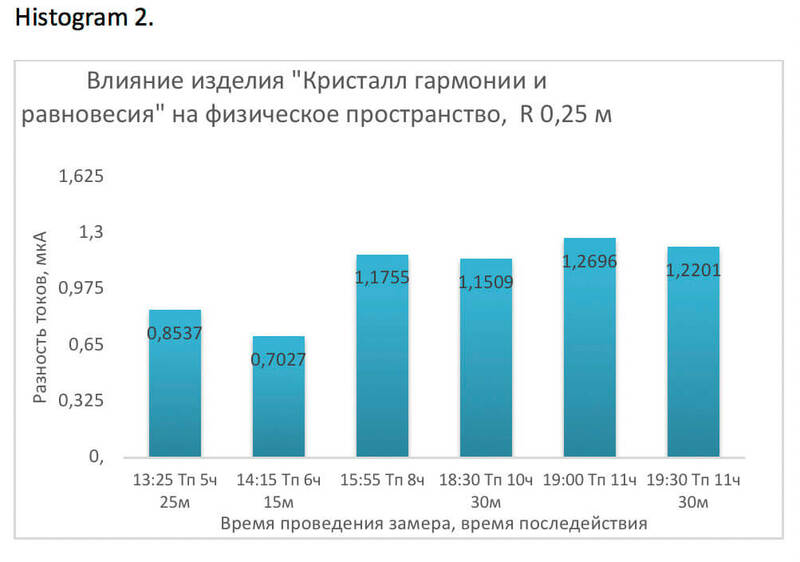 At the same time, линия1 (total action of KFS and CH&B), except for a higher (D to 0.73 µA) start-up capacity, has a deeper amplitude of "breathing", from 0.4 to 2.4 µa (D 2 µA), while for line 2 (CFS) from 0.45 to 1.05 µA, the amplitude D of 0.6 µA. Chart 2 shows the relaxation process for line 2, and structuring the aquatic environment, line 3, after removing external influences from the investigated devices at a distance of 0.25 m. the Obtained data clearly reflect the strength and nature of KFS and CH&B on the physical space. Structural and energy changes of water samples are developing in different directions. So, if line 2 within 12 hours practically reaches "0", i.e., water environment relaxes completely, returning to its original state, then line 3, on the contrary, reaches its maximum during the same period of time. The absolute value of the conductivity is shown in Histograms 1 and 2. The relative magnitude change of conductivity shown in Table 1. 1. The product "Crystal of Harmony and Balance" has a high structuring potential of the aquatic environment, the surrounding space. 2. Eniopotential of “Crystal of Harmony and Balance” has a significant impact on the work of the technical devices of the series KFS.